As many of you know from reading this blog, I spend about 40% of my time teaching software programming classes for Automation Training, a Canadian company. I started out teaching the Allen-Bradley SLC and ControlLogix platforms and Siemens Step 7 (S7-300 and S7-400). Since I am quite familiar with both of these platforms, I didn’t have a very steep learning curve. Recently I had to add the new Siemens TIA Portal software and its associated hardware platform to my skillset. I had never done an actual project with this platform, so I spent some time practicing and checking out all of the differences. I feel like I’m pretty up to speed at this point, thanks to Mike Henry of AT and some practice teaching. I will be writing a post discussing this platform soon. Now I am about to go to Dallas and teach my first Wonderware class. I have done several Wonderware projects in the past, including one for Proctor and Gamble as well as another for Carrier. These projects were both about 8-10 years ago and I found the software to be a bit clunky and old school compared to some of the other HMI and SCADA packages I had used previously. Most of my experience prior to that time had just been editing existing screens or adding new ones to existing projects, so I felt like maybe I hadn’t given the software a fair shake in my evaluation. Now I have an installation of InTouch, Wonderware’s screen creation and HMI design software, at my disposal. After spending time playing around with it and reviewing class material with Mike, I feel better able to evaluate the platform and discuss it. I have also done some research on the history of the company. Wonderware was formed in 1986 by a couple of software guys from Triconex, a redundant control PLC hardware company. Dennis Morin had envisioned a software product for monitoring factory operations that would be fun and easy to use. He enlisted the help of Phil Huber, a co-worker and tech wizard who he had worked with. They started the company with a $100,000 investment and the company grew quickly. In early years Wonderware was known for their outrageous marketing strategy. They chartered cruise ships, hired bands and lingerie models and otherwise hyped the company to the normally conservative engineering audience. By the mid-1990s they had a major market share in the SCADA world. They were bought by the British company Siebe for $400 million in 1998, when the company Invensys was formed. Invensys also owned Foxboro, Triconex, Avantis, SimSci-Esscor and Indusoft by 2014, when they were bought by the French conglomerate Schneider Electric. In 2006 the Factory Suite A2 platform was combined with an industrial application server called Archestra. This was a service oriented architecture (SOA) that provided a common set of controls and development tools. It was advertised as a “System of Systems”. The main HMI and Supervisory Control software is InTouch, which allows programmers to create screens, configure alarms and integrate computer systems with various PLC and control platforms. There are a variety of toolkits and alarming capability within the basic runtime package. A recipe manager is also included for basic recipe management. A “WindowMaker” and “WindowViewer” environment is used to program and visualize the screens. Various scripts for evaluating data and changing the status of screen objects can be written within the platform environment. Tags are used for internal system functions and can also be imported from controllers. ActiveX objects and events are also accessible from the software, other advanced pre-made objects such as trends, meters and symbols can be obtained from the included libraries using a “wizard” dialog. Objects can be easily animated to change color or position through the tag interface. Licenses are sold on a “concurrent user” basis which assigns licenses on a per active user basis rather than per device. This model limits the number of applications that can be run simultaneously using a license manager. Development licenses are still sold on a per install basis but can be moved from computer to computer. Analyst for quality, a more advanced recipe manager and a process modeling package called Skelta BPM. MES software is generally used for the “Who, What, When, Where, Why and How Much” facet of work order execution. A third group of products includes Data Historian related software. This allows users to archive, retrieve and analyze process information from the plant floor. Cloud based services, mobile device access for smartphones and tablets and a variety of report generation options are also included in this group. 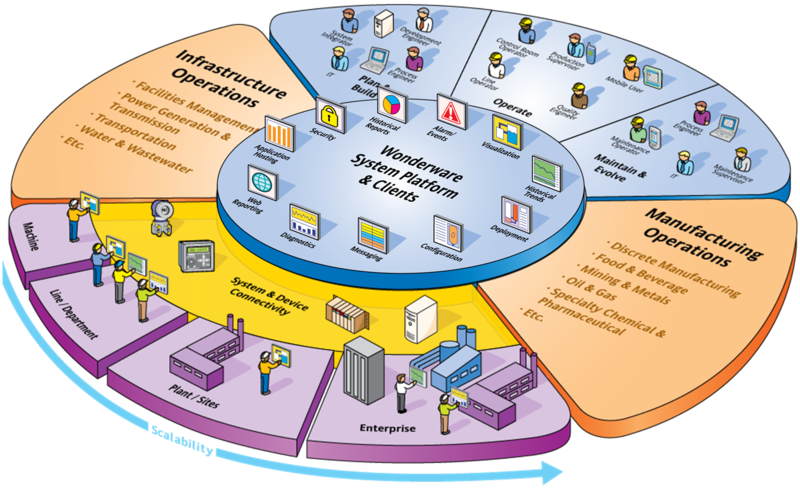 Wonderware has been the major player in the plant visualization and SCADA field nearly since its inception. Like the brands “Kleenex” and “Coke” it is often used as a synonym for computer based machine interfaces. As with Allen-Bradley and Siemens, its use is widespread so whether you like it or not, you are going to run into it in a lot of plants. In my opinion the interface between people and machinery is more of a result of the programming and design than it is on which brand you choose as a platform. I still find the software less intuitive than some of the other brands I have used, but the help files are decent and you can pretty much accomplish anything you can with other packages. I don’t know much about the pricing since I haven’t installed many “green field” applications, but from what I understand it is competitive with the other major brands. I have heard some really good things about Ignition, a Java based visualization software by Inductive Automation. The people I have talked to who have used it say it is very user friendly and cost effective. Since I haven’t done any development with it yet I can’t speak from experience, but is seems to be the up and coming thing. I look forward to trying it out at some point and welcome any feedback you may have. Fortunately this class I am about to teach is very short. I will be able to get my feet wet on the kinds of questions people may ask without getting too deep into the subject matter. Then its back to Miami to hopefully wrap up my ABD process job. Which, by the way, uses Allen-Bradley’s RSView32, A-B’s answer to Wonderware from the 1990s era.